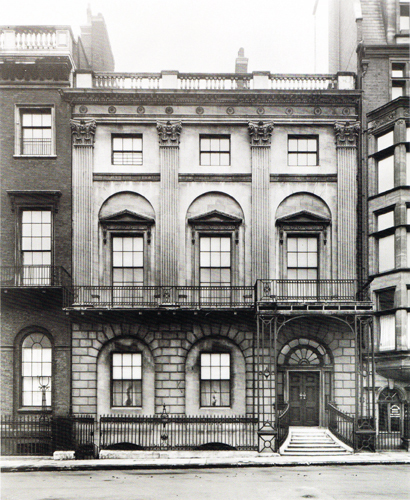 In 1771 he agreed to buy 20 St James’s Square from Lord Bathurst who obtained an Act of Parliament not only to permit the sale of the house, which was entailed under a marriage settlement, to Sir Watkin, but also to demolish the seventeenth century house and rebuild on the site. 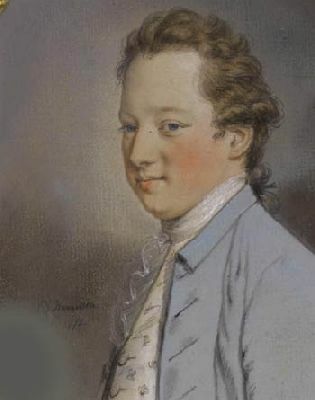 Sir Watkin had been taking lessons in architecture from James Gandon in the early months of 1771, and it was Gandon whom he had employed to survey and value Lord Bathurst’s house in April of that year. At the same time Gandon had made five plans, two sections and an elevation for a new house on the site. 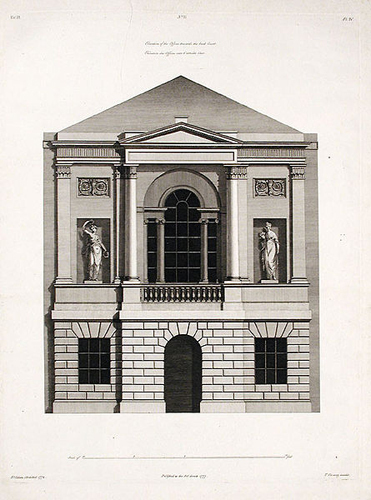 However, by the following year it was Robert Adam who was designing a new house for him. The house was finished in 1775 and the occasion was celebrated with a musical breakfast, and country dances below stairs on May Day of that year. Few of the accounts for the work survive, and those that do relate more particularly to the finishing and furnishing of the interior, which continued during the years 1775–7. Robert and James Adam’s bill for their plans and for surveying the work amounted to £1388 13s. and as this was ‘at 5 per Cent’ the total cost, including their bill, was presumably something over £29,000. This sum probably included not only the Adam designs for a wide range of furnishings and fittings, from an organ case to an inkstand, but the cost of the actual furnishing materials and upholstery. The workmen included John Devall, mason;2 Edward Gray, bricklayer; John Pratt, slater; James Lloyd, glazier; D. Adamson, painter;3 William Chapman, plumber; Joseph Rose, plasterer;4 Richard Collins, joiner, who made figures on the organ case; and William Kinman, coppersmith. A number of different craftsmen in metal worked on the house. Those engaged on the interior included Thomas Blockley and Thomas Tilston, locksmiths; Edward Gascoigne, brazier; William Bent, ironmonger; William Sparrow, wireworker; and William Hopkins, who provided iron and steel grates. John Hinchcliff was paid £360 10s for marble chimneypieces, one of which (that in Lady Wynn’s Dressing Room) contained basalt tablets painted in encaustic colours5 by Josiah Wedgwood, to whom Sir Watkin was an early friend and patron. Domenico Bartoli, the scagliolist, also worked on this chimneypiece. 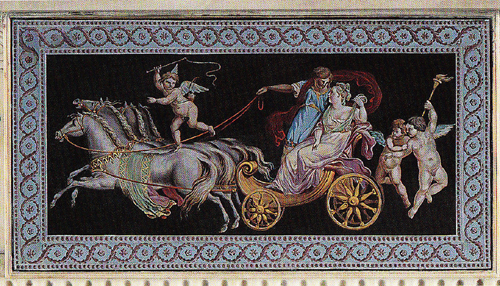 Josiah Wedgwood’s basalt tablet with the Triumph of Venus painted in encaustic colours after a design by Antonio Zucchi. 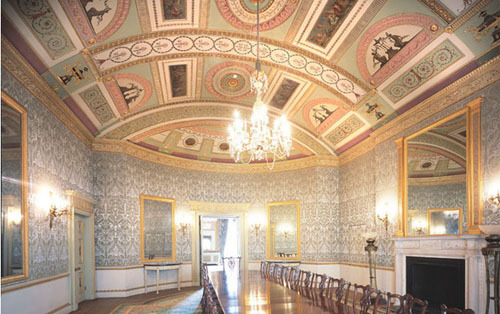 The paintings inset in the ceilings of the music-room, great drawing-room and Sir Watkin’s dressing-room, and in ornamental panels and overdoors were executed by Antonio Zucchi who also painted door-panels and bookcases. In addition he designed bas-reliefs and statuary for the chimneypieces, and wooden figures for tripods, and was paid by the tradesman who supplied carpets for painting a pattern. The curtains, hangings and upholstery of the main rooms were in pea-green silk damask, while pink or red was the colour proposed for the festoon curtains and upholstery in Lady Wynn’s Dressing Room. The Music Room was undoubtedly the most important room in the house. Music was Sir Watkin’s passion. His annual expenditure on lessons, instruments, musicians and singers averaged at £300. The organ is now in the National Museum of Wales. The case was designed by Adam and the instrument made by John Snetzler. The Williams Wynns family occupied the house until 1906 and owned it until 1920. It was then sold to the Eagle Star and British Dominions Insurance Company Limited and Messrs. Hampton, the estate agents. In 1935 the Distillers Company bought the house and also the vacant site of No. 21 next door. In the following year Messrs. Mewès and Davis built a new block of offices on the two sites, incorporating the principal parts of No. 20, which was given (with No. 21) a mansard roof containing extra storeys. The façade of No. 20 was restored nearly to its original appearance and the design extended to form the façade of the new building (see top of page): the elevation thus created is uncharacteristic of Adam in its treatment of so long a frontage. No. 20 was damaged by enemy action during the Second World War but was restored afterwards and extensively refurbished in the late 1980s. I was employed to match the existing colours of a number of the ceilings. 1 Much of this has been taken directly from the Survey of London. 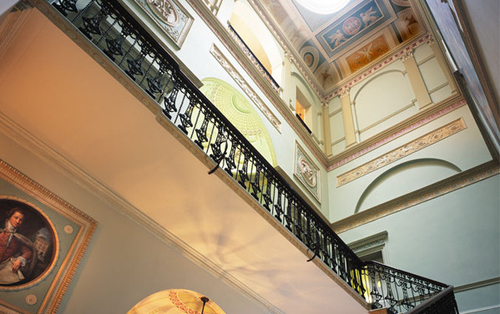 2 Chimneypieces by him can be found in Crichel House and Kings Weston House. 3 This is likely to have been David Adamson, who worked for Robert Adam at Osterley House ca.1770. In the Westminster Poll Book of 1774, for the Parish of St Margaret’s and St John’s, Westminster, he is recorded as living at the Adelphi (another Adam project). 5 This new method of encaustic paint, which Wedgwood developed, for vases was soon extended to tablets. It was intended not only “to imitate the Paintings upon the Etruscan Vases, but to do much more, to give the Beauty of Design, the Advantages of Light and Shade in various Colours; and to render Paintings durable without the Defect of a varnished or glassy Surface.” (Quoted in Harris 2001, 266). Eileen Harris. The Genius of Robert Adam. Yale University Press. 2001. F. H. W. Sheppard (General Editor), Survey of London: volumes 29 and 30: St James Westminster, Part 1 (1960), pp. 164-174. What a marvelous post. I have walked by the house so many times and wondered what lay within, it’s a joy to get a look in, especially as it lives up to my hopes. Thank you Adam. The interiors are splendid, although it’s been offices for many years now. Thanks Jan. What a wonderful memory. Sadly, I have not been back in the building for about 20 years. Thanks Luke. I shall email you some suggestions. If so, please direct me to the correct person to discuss copyright permission. exquisite–I’m here on account of Lady Williams Wynn and her voluminous correspondence from the Regency era. 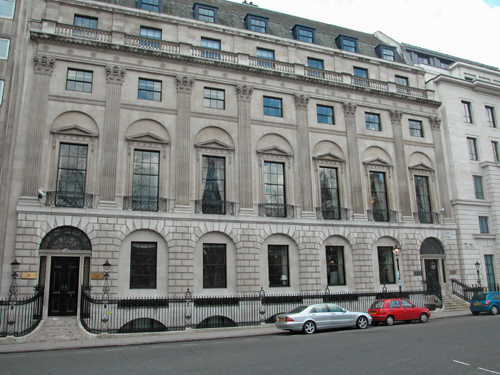 How nice to see the interiors of her husband’s house in St. James Square. Hi, lovely article and super illustrations. Could I ask if you are aware of the current owners (June 2017) as the previous ones went into administration I believe. Thanks for that. I am afraid that I have had no dealings with the house for over ten years.